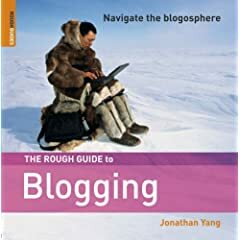 ANSWERS Book Reviews » Blog Archive » "The Rough Guide to Blogging"
"The Rough Guide to Blogging"
An Introduction to blogging. Jonathan Yang introduces one to all the important things and terms in the blogosphere. He suggests that one starts out reading lots of blogs at first to get some ideas. He presents a sample of blogs from every major category except religion at the back of the book. Then he presents some major ideas and tips about blogs. He shows you where to go to get started. Then provides invaluable info. on how to make the most of your blog and blogging. He has some design tips and them moves on to talk about writing and gives a number of tips there also. He presents info. on audio, video, and podcasts. Then finishes up giving some suggestions on how to increase traffic to your site and also how to monetize it.